ERP SOFTWARE - Is It Worth for School Management? We live in a society where technology revolutionized our lives, preferably in a positive perspective. Likewise, the education sector is no different. Technology changed the chalk-duster concept to e-classes which implemented effective presentations and what not to make education easy and interesting for kids. Recently, a new concept has entered the mainstream of education sector- ERP (Enterprise Resource Planning) software to simplify the tedious school management system. Its main objective is to decrease the manual work and make the process less time-consuming along with an interesting ecosystem. What’s the point of adopting ERP software over the usual and manual school management? To begin with, proper management of time along with an efficient and an error-free atmosphere, ERP solution leaves all the traditional techniques far behind. Data and all other detailed information of students and staff are held manually in files. In case of any robbery or an accident like a fire or any such mishap, you are left empty handed with no data with you. In ERP, data is centrally managed and permanently stored on its server which has encryption in its framework for security purposes. ERP simply removes the concept of those old big files and folders stored in large cupboards. Setting up a reputed school is near to impossible if you do not hold a good capital in your pocket. It requires a huge capital paying the manpower involved in processes like fee collection, accounts management, admissions, sales process, etc. The concept of ERP totally washes away this manpower and makes everything managed and accessible over an online built platform. Hence, managing tasks accurately in a cost-effective manner. Monitoring the fees payments in the accounts department becomes time-consuming, laboursome and a tiring process for the employees. There are even equal chances of committing mistakes. 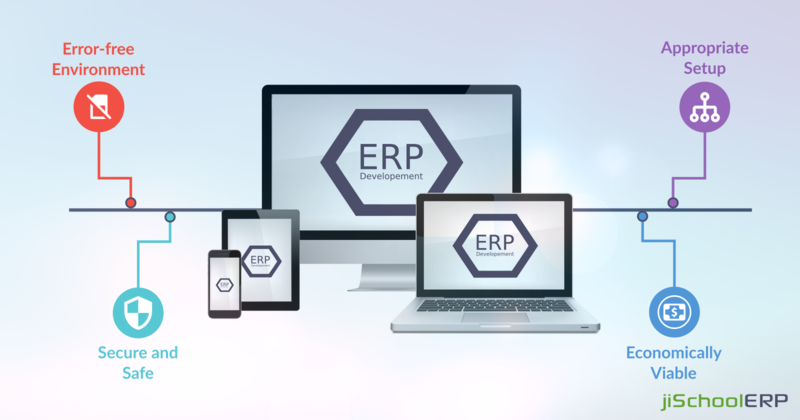 But ERP software has an automated system with a framework that manages the accounts work automatically, thereby eliminating the chances of error and providing accuracy. The specialized team of ERP creates an appropriate setup according to your school’s requirements, strength and other aspects. This results in fetching out the maximum possible potential from your organization in a best suitable way. A user-friendly atmosphere for teachers, parents, employees, and students with an enhanced set of technology tools can be experienced only via ERP solution. The time teachers wasted in taking attendance and maintaining records of students has now been replaced by an automated software. A similar ERP solution “jiSchool ERP” which has a lot to offer you. Whether it be admissions, grade reports, fee management, invoice & payments, transport, and library facility, or homework assignments, it manages all smoothly. Its other add-ons include fast implementation service, a user-friendly and multi-featured dashboard, flexibility, easy usage, and management. In case of any query and issues, jiSchool ERP provides an expert support team with 24/7 services along with SMS alert services for getting notifications and updates. For further details reach us at our website. Welcome the excellence of technology and EXPERIENCE THE BEST.